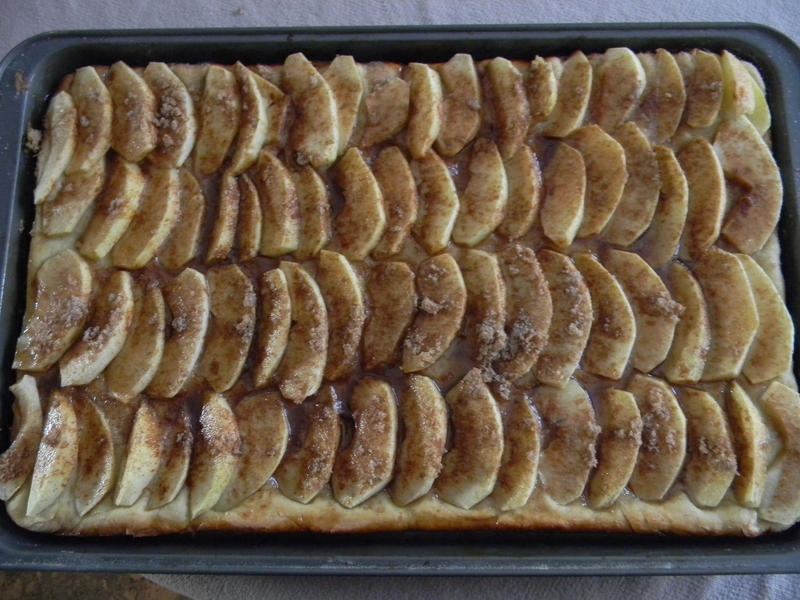 This is an apple coffee cake that was made by my German mother-in-law. It has a yeast dough base and is topped with sliced apples. My mother-in-law also used sliced plums on top of the cake in place of the apples when the plums were in season. 1. Dissolve the yeast in the water. 2. Place milk in a large bowl. Add butter and granulated sugar. Stir to melt butter and dissolve sugar. Cool to like warm. 3. Stir in the dissolved yeast. Beat in half of the flour. Stir in the egg yolks and salt and then enough flour to make a soft but not sticky dough. 4. Knead on a lightly floured board until smooth, about eight minutes. Place the kneaded dough in a clean greased bowl, cover and let rise in a warm place until doubled in bulk, about 1 to 1 1/2 hours. 5. Knock down the dough and fit into a large jelly roll pan. Cover and let rise in a warm place until dough has doubled in bulk and three-quarters fills the pan. 6. Preheat the oven to 350 degrees. 7. Arrange the apple slices in neat rows over the surface of the dough. Brush with a small amount of melted butter and sprinkle with the brown sugar and cinnamon. 8. Bake 25-30 minutes or until dough is light brown around the edges.